Holding icons and candles, whispering prayers and making the sign of the cross, they stared at the building day and night. 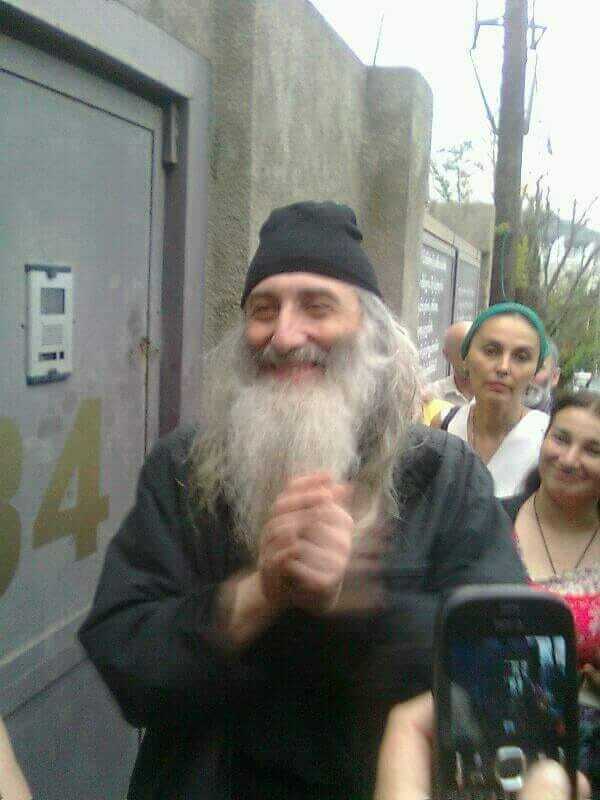 In his earthly form, the resident of the building on Tbilisi’s Barnovi Street is Nikoloz Makarashvili, a self-styled priest known to his admirers as Nariman the Monk. In Georgia – which surveys have identified as the most God-fearing country in Europe – Nariman is the latest folk holy man to capture believers’ hearts. His followers claim that Nariman performs miracles nigh daily and his touch treats diseases like pneumonia and glaucoma. Georgia’s powerful church authorities disagree: In 2016 the Georgian Orthodox Church announced that he was excommunicated, vaguely citing unexplained “health concerns.” But even after being formally defrocked, Nariman has continued to wear his priestly robes and retains an avid following. An urban hermit, he has sworn off speaking and buried himself in his centrally located seclusion, living off donations from his followers. Nariman communicates by handing out letters to members of his ersatz parish, who then labor to puzzle out the secret meaning of the epistles. “I cut my hair and beard because I have problems in my brain,” Nariman reportedly wrote in one note, according to a follower who read out the letter to reporters from a local TV channel. It was a commentary, she continued, on current affairs. “The disease he mentions here is the political parties that are blocking the sun above Georgia,” she said. As his flock grew, the story of the Barnovi Street god increasingly drew media attention. Journalists went to interview both Nariman’s neighbors and followers. Residents of the building turned out to be less than ecstatic about the divine tenant next door, saying that he threw garbage from the window and that the constant presence of his followers had grown tiresome. A large crowd, praying and singing hymns, would turn up on Christian holidays. The devotees mostly worshiped outside the building, but they often milled around the staircase, waiting for Nariman to reveal himself and pass on another missive to the world. His landlord said Nariman was shirking on his rent, but his parish put up fierce resistance to attempts to evict him. Police were called repeatedly to calm trouble at Barnovi Street until the monk finally moved out late this winter; he and his followers now grace another building on the outskirts of the city. Nariman is not the first defrocked priest to vex the Georgian authorities. In the 1990s and early 2000s, one Father Basil Mkalavishvili undertook a crusade to defend Orthodox Georgia from the heresy of Western Christendom. He was excommunicated in 1996 but remained undeterred. He and his devotees, armed with icons and wooden crosses, went so far as to chase and beat Jehovah’s Witnesses, Baptists and other converts to non-indigenous beliefs. Basil was eventually arrested in 2004 in a violent police raid that matched, if not surpassed, his posse’s own brutality. The official Georgian Church has kept its distance from types like Nariman and Basil, but some Church-recognized clerics have commanded fanatical followings, too. Most prominent among them was Monk Gabriel, another hermit who also enjoyed a reputation for working miracles. Georgia’s last saint, Gabriel was canonized in 2012, seven years after his death. In 2014, his body was festively exhumed from his grave in the spiritual capital of Mtskheta to demonstrate how it remained pristinely undecomposed. Thousands jostled for a chance to get close to the remains; the scene was so ecstatic that soldiers were deployed to maintain order. Georgia’s latter-day saints and eccentric forms of devotion to them rode in on the wave of religious fervor that followed the collapse of the Soviet Union and its state-enforced atheism. One of the features of Georgia’s religious renaissance is a sense that Georgia is a uniquely holy place. In those early years of independence, exotic beliefs began to gain currency: that Judgment Day will be conducted in the Georgian language, based on contemporary interpretations of a 10th century ode to the Georgian language; that the nation is under Mary’s personal patronage; that Georgia will struggle through its tribulations to shine eventually under the grace of God. These beliefs were circulated in songs, art and toasts at the dinner table. 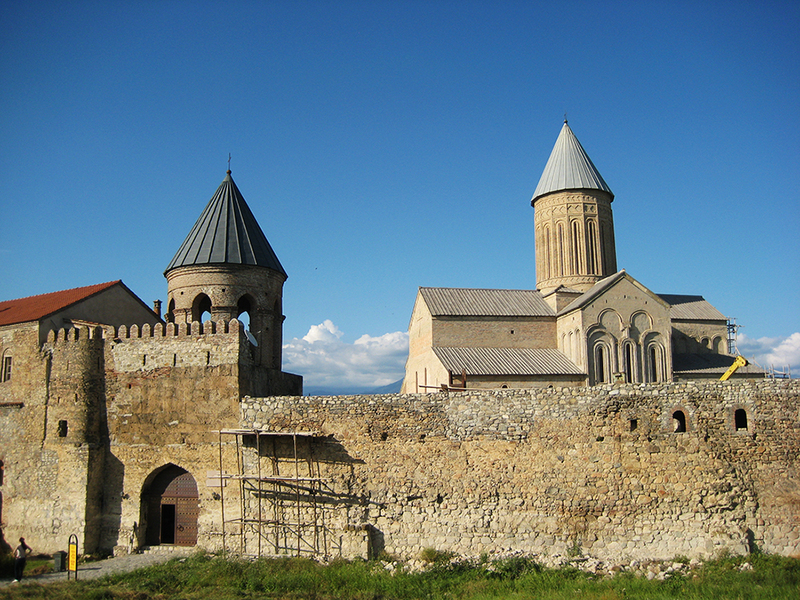 “Ethnophyletism, or religious nationalism, became stronger and there was a growing conviction that Georgia had a special place in God’s design,” theologian Beka Mindiashvili told Eurasianet. This new-found religious ardor began to take on extravagant forms, with believers seeing miracles all around them. Old men and women emerged with mysterious powers that only their followers could witness. The discovery of cross-like shapes in tree moss, damp stucco on a wall, or in the grain of a newly hewn log would be interpreted as a revelation and inspire group prayer and the construction of a shrine. In one village in the southern region of Tsalka, believers regularly queued to pet a friendly trout living in a sacred pond in the belief that it could relieve liver problems and migraines. The government was forced to sponsor a public service announcement pushing back at a belief that a new smart ID card was a Satanic plot. And yes, there were a few exorcisms. Surveys also show that, in spite of widespread professed belief, few Georgians regularly attend church or rigorously follow its teachings. Instead, believers tend to take shortcuts to God via on-the-go, customized rituals. Drivers let go of the wheel to make the sign of the cross at the sight of every church. Small shrines grace homes, offices and vehicles. Countless numbers of cars, shops and apartments display cross stickers – a sign that they were blessed by a priest. Georgia’s religious new age, with its customized rituals and neighborhood saints has found a mass media outlet on one television station, Quality Channel. Its anchors can often be seen recounting some peculiar anecdote from a saint’s life. “So, one day, as Monk Gabriel sat in his cell, devils were sitting up in the ceiling throwing stones at the grand piano…” one such tale began. The main presenter, Giorgi Asatiani, explained how he knew that the Internet is Satan’s creation. “In the English alphabet, ‘w’ is the 23rd letter,” he said in a recent broadcast. “You multiply two by three and you get six, so www is actually 666, the sign of the beast,” he said.